On Saturday, we met up with Mars, Josh, Tiffany, and Daniel, and had brunch at The Elite Cafe. You gotta love a place where mini donut holes are on the starter menu! Then we all made our way over to Japan Town to check out the J-Pop Summit. Miss Alphabet and Locketship had booths right next to each other, which made for convenient shopping and hang outs! Check out Zambi’s blog entry for better details about the booths!! I didn’t take any photos! I wish I had a photo of me and Amy and her friend Josh, since he was wearing gigantic platform boots which made him 7 feet tall and made us feel teeny tiny! 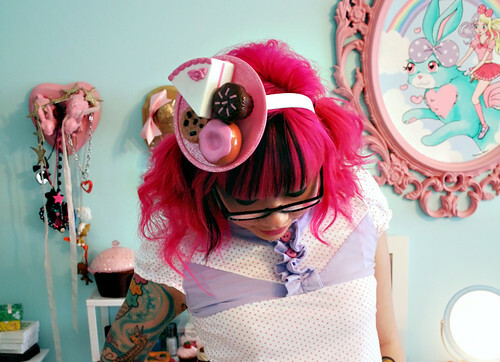 Anyway, today I wore my purchases from that day: a cakey hat by Locketship and a cute top from Miss Alphabet! Too bad you can’t tell from the photos really that the cake plate is sparkly, and so is the lavender fabric on the shirt! Then I decided to pile a bunch more crap into my hair. This hat/headband is the most amazing accessory ever. Only downside: it’s mounted on a child’s head band, and I have the biggest head on the planet. I can wear the headband for maybe 2 hours and then it’s brain explosion time!!! Oh well! WORTH IT. I like the OTT hat/headband… stick it on an adult thingie my jig, so you can wear it more often..
Oh man this thing is attached to the head band with a screw! haha, me too! I hope i get a few chances to wear it! I was at J-pop both days and I tried on that exact head band, I agree it is really cute, I was worried that it might slide off my head because of how on the side of the head band it is. J-pop was so much fun! I love you! That shirt is to die for .. and that nail polish :3 how much was that? Prob lots with shipping, but I WANT IT. I got if for 8 lbs, and ended up paying about 12 pounds total…so depending on the exchange rate…somewhere a little more than $18 bucks?? That hat is the coolest! That is truly amazing. You are the cutest person on the planet I swear and you rock all that so well! aw thanks so much! it is a bit silly for every day wear, but will be fun for special outings! Ahhhhhhh! That cakey hat/headband is toooooo cute! I want one! Where do I get one! 😛 So is the top! That hat is frikkin’ amazing! Your cake hat is the most AMAZING, ADORABLE thing EVER!!!!!! For real. So cute! Great nail polish colour. Wow your head can hold alot of stuff 🙂 you look as though you’ve lost weight ~ gym’ing it? OH man, that is probably an illusion created by the large thing on my head :P. I am just as jiggly as ever and not really going to the gym nearly enough! HAHAHAHAHA I would have warned you if I knew you were gonna buy it! I almost got it too, but when I tried it on I knew immediately that it wasn’t going to happen. I tried it on when I was there and felt it was worth the skull torture!